Allows removal of Legendary stats from weapons and armor. Give many thanks to teaLz for making Legendary Modification which allows us to put legendary stats on all our weapons and armor. 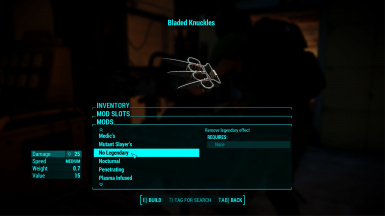 If you have Legendary Modification by teaLz, this will allow you to remove the legendary stat from all weapons and armor which will allow them to be scrapped for parts.